E-61 BREW GROUP – You see this group on many machine and for good reason! 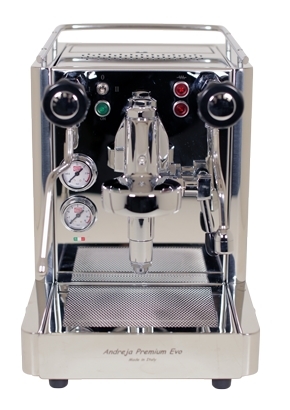 For more than 50 years, the E-61 style brewing group has proven itself in terms of dependability, ease of servicing, and most importantly, the ability to deliver excellent espresso! The E-61 group's main feature is its thermosyphon water circulating design which constantly moves hot water through the group to keep it near brewing temperature. With no moving parts, this improves thermal stability to every extraction. STAINLESS STEEL CONSTRUCTION - High quality stainless steel frame and panels eliminate the possibility of rust, are easy to keep clean, and blend in with virtually any decor. GAUGES – The Quick Mill Andreja Premium EVO has dual gauges. One shows the pressure inside the boiler which is an indirect measurement of the temperature of the water, and the other shows the water pressure being delivered to the coffee during the brew cycle. ADVANCED BOILER – The boiler is insulated which makes the Quick Mill Andreja Premium EVO more efficient in terms of energy consumed. It also features an internal T.E.A. (Ternary Eco Alloy) coated which not only protects the boiler from corrosion but also eliminates metallic leaching which can taint the taste of the coffee. The T.E.A. coating Has passed the most stringent NSF testing for use with hot water. NON-COMPRESSION HOT WATER and STEAM VALVES – Many valves in home machines use compression valves that eventually need to have the sealing parts replaced. These non-compression valves in the Quick Mill Andreja Premium EVO will not be damaged by over-tightening. RESETTABLE OVER-TEMPERATURE SAFETY THERMOSTAT – In the rare event of overheating the safety thermostat will open turning off the Quick Mill Andreja Premium EVO. Once it cools, simply press the button on the thermostat to reset it. VACUUM BREAKER VALVE – This allows pressure to be released when starting up the machine when it is cold. This releases the “false pressure” vapor lock in the boiler much like what a pressure cooker does when it is heating. Less fiddling for you and faster heating for the boiler. SIRAI PRESSURESTAT – The pressurestat controls the heating element, and thus the temperature in the boiler. The Sirai commercial-grade pressurestat in the Quick Mill Andreja Premium EVO is well known in the industry for its dependable service and durability. 52 WATT ULKA PUMP – If you have been shopping you will have seen that many machines use 42 watt pumps. More wattage means the pump does not have to work so hard. This pump also features a thermostatic protection switch that shuts the pump off if it overheats. THREE LITER WATER RESERVOIR – The large-capacity reservoir means more time making espresso between refills. Want to eliminate that completely? An optional direct-connection kit is available to “plumb in” the Quick Mill Andreja Premium EVO to a pressurized water source to eliminate the reservoir. No more refilling! DUAL MAGNETIC SENSORS - When the reservoir is getting close to being empty an audible alert sounds letting you know it is time to refill. You will still have enough water to finish that extraction and maybe one or two more. When there is insufficient water for safe operation the second sensor turns the Quick Mill Andreja Premium EVO off, protection the heating element and the pump. EASILY ACCESSIBLE BOILER DRAIN - located on the bottom of the boiler is a drain valve that makes it easy to drain the boiler. This is very handy when the machine needs to be shipped or if it will be stored in an environment that may subject it to freezing. The Quick Mill Andreja Premium EVO comes with two complete portafilters, one single and one double. Also included is a blind filter for backflushing the group.